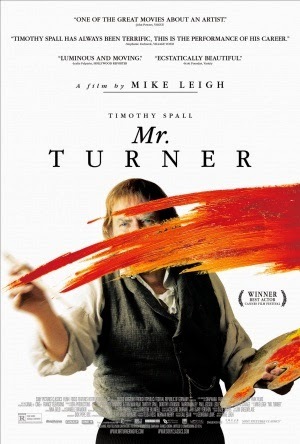 From accalimed British filmmaker Mike Leigh comes Mr. Turner, a biopic on one of the most renowned artists who ever lived, whose legacy continues to have a huge impact on the fine art community countless decades after his death. Starring Timothy Spall as the eponymous J.M.W. Turner, Mike Leigh's film tackles complex issues and strives to be an honest rendition - but slips up when it comes to genuine entertainment. Mr. Turner documents the major parts of the titular characters life, including the passing of his father, his travels around England, his controversial relationships with women and his own children, and his eventual decline in the art world shortly before his untimely death. Mr. Turner is extremely difficult to critique - it is beautifully filmed, with stunning production design and an exceptional performance from Timothy Spall. But at the expense of this visual grandeur and interesting drama, the film suffers from a sluggish pace and occasional lack of focus. Things move slowly for a while, then hop around too quickly at random moments; on several occasions, I had absolutely no idea what was going on or who certain characters were. Perhaps it caters more to passionate fans who are engrossed in Turner's work, but for general audiences, it is easy to get lost. It certainly succeeds on a technical and artistic level, and it's not without a dose of likeable humour, but we must never forget one of the most important aspects of film: entertainment. And sadly, Mr. Turner is lacking in this field - at 150 minutes, it is testing to say the least, and when I thought things would soon come to a close, the film was nowhere near it's conclusion. I can't say much else in the long run - on an aesthetic level, it is brilliant. But as entertainment, it just didn't quite click with me.